Sometimes, on my early evening walk, I like to go to the Trap Grounds, a seven-acre urban wilderness about ten minutes' walk from my home. Here reed beds sit alongside small ponds, woodland is interspersed with scrubland and a boardwalk lends a tropically swampy feel to muddy water: all a rich mosaic of plants and wildlife habitats, housing a variety of birds and butterflies, plus dragonflies, glow worms, water voles and a lot more. I recently downloaded the site's map, and discovered that the team of committed volunteers who manage it have named different areas. 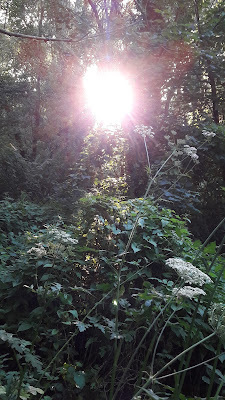 My seven-year-old self would have thrilled at them: Frog Lane... Cuckoo Copse... Foxglove Meadow... Periwinkle Wood... Primrose Path leading to Dragonfly Pool on one side and Slow-Worm Glade on the other... fairy tale names for a fairy tale place. And in the middle, just by one of the ponds, is a small area called Magic Kingdom.